Margie's Crafts: Sky Is the Limit! This stamp set is FREE with a $50 order! This set will ONLY be available through February 15, though other Sale-A-Bration items will be available through March 31, 2016. 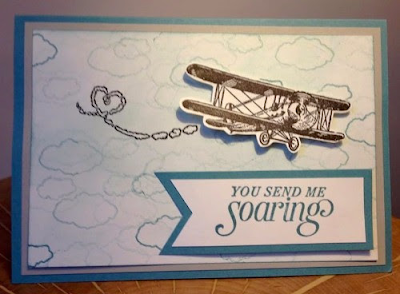 Stamp the airplane onto a scrap of Very Vanilla in Early Espresso ink and fussy cut. Use a sponge and a tiny amount of Lost Lagoon ink and swirl over the Very Vanilla front layer to make the sky. Ink up the clouds with Lost Lagoon ink and stamp off several times before building up the sky, re-inking as necessary. Stamp the heart trail in Early Espresso, leaving enough gap to put the Plane on with dimensionals then adhere the plane. Punch the ends of the 2 banner strips. Stamp the greeting in Lost Lagoon onto the Very Vanilla banner strip and cut to fit the front of the card. Cut the Lost lagoon banner strip to fit the Very Vanilla strip and adhere to the front of the card.